Twelve years is a long time. Twelve years ago was a very different place for most people. Twelve years ago, on a whim, I did something I’d never done before and it’s shaped my life ever since. March 5th 2005. I don’t normally remember dates of things, but I seem to remember this one. 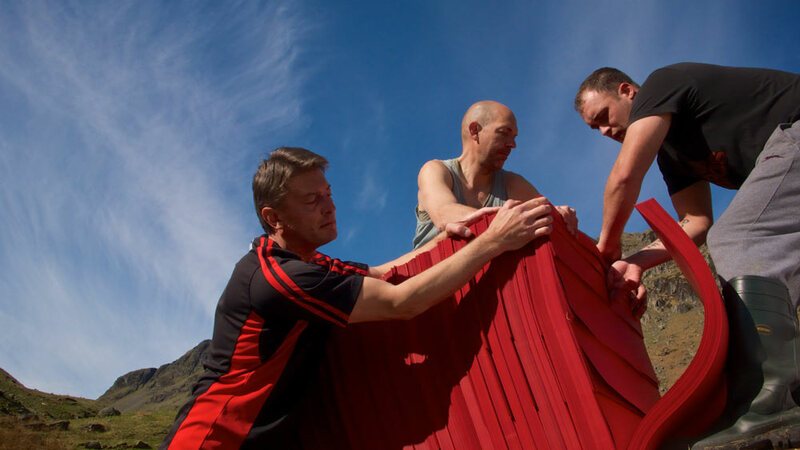 It was a calm, sunny day and we were rowing giant red balls across Grasmere in the heart of the Lake District. The year before I’d helped create a new festival of art in the landscapes of Cumbria and the Lake District in the North of England. Off the back of that, the local tourist board wanted to know if I could do something to get a bit of media attention for the Lakes out of season. Maybe something big? I think their original idea was something along the lines of a big red nose for Comic Relief. The normal PR stunt thing. But while they were thinking of something 12ft tall, I was thinking something over a mile long. 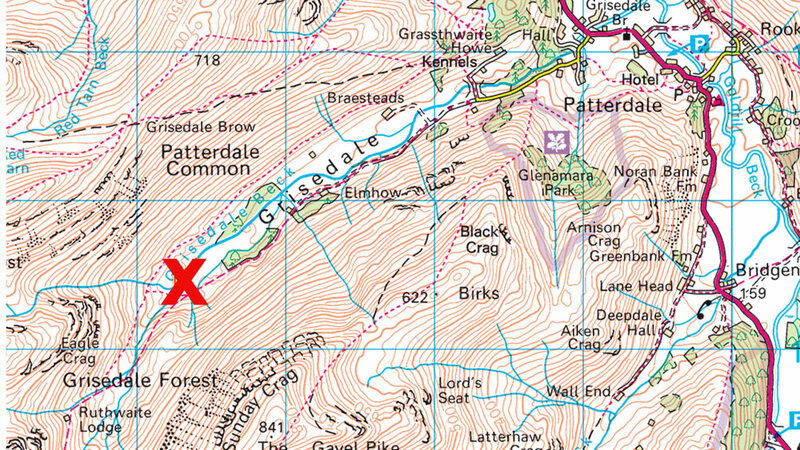 The original idea was a dotted line weaving the length of Grasmere – north to south. Needless to say the budget didn’t run to that, so a much smaller version was devised whereby the balls would rush towards the southern shore beneath Loughrigg with the balls getting progressively larger to accentuate the perspective. The piece I believe was to be installed for a week or two. The balls were PVC and commissioned from a fabricator based on a farm in Devon and arrived in three large boxes that fitted in the boot of my Renault Clio. Lengths of sinking line were bought from the Ropemakers in Hawes, Yorkshire and concrete breeze blocks were bought from my local builders merchant in Kirkby Stephen for anchorage. 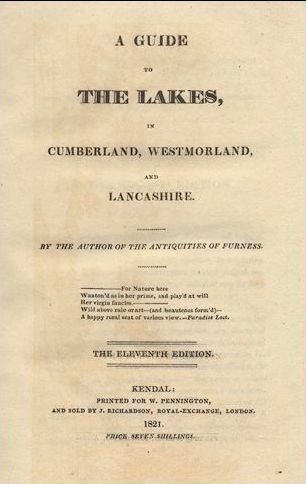 Grasmere was chosen as it was both a relatively small lake (one mile by half a mile, approx.) and conveniently placed at the edge of two local TV regions in the hope that both would show up and double the coverage. However, Grasmere has a little-known by-law prohibiting the use of powered vessels on it. The only way to get the balls in position was towing them in rowing boats. Luckily, the Faeryland Tearooms at the top of the lake had a small fleet of boats to hire and kindly stepped in to help, along with a bunch of artists volunteering for the cause. The prevailing winds off the Helvellyn range blew north to south in the mornings and with a relatively still day the elements were on our side. That’s not to say there’s anything even vaguely easy about towing big inflatable balls the size of a small house 3/4 mile across a lake. There was a small window in mobile phone coverage so the fine-tuning of the installation was done with me halfway up Loughrigg with binoculars and a cell-phone calling the people in what from there looked like very small boats. From the clients’ perspective it worked well. 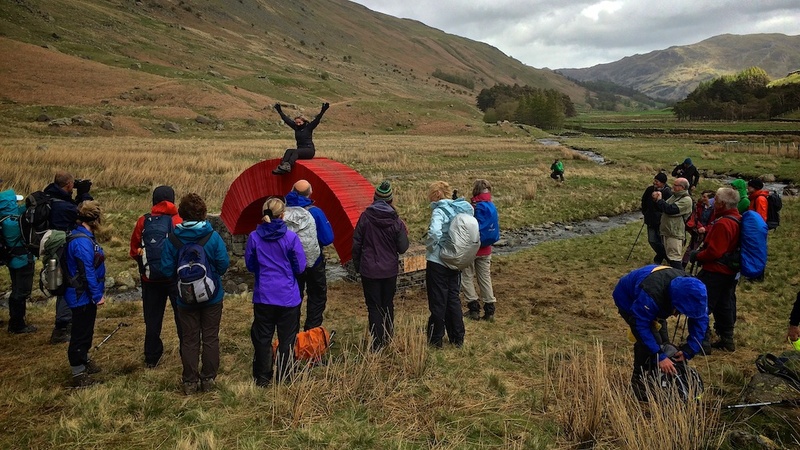 We had TV and radio coverage across the whole of the North of England, some cracking photos and a good news story of artists doing things with the iconic landscapes of the Lake District National Park. For me it was a very steep learning curve and baptism of fire into doing things of that scale. Among the things I learnt were practical things like the importance of calculating wind drag on large objects on water (they drifted lots), and the general volume of logistics to do something that looks quite simple. But I also learnt lots more fundamental things about work of significant scale – the way light and weather affects and adds to the piece; the way colour works in landscapes; the interaction of people in appreciation of scale; what it feels like to experince work of that scale. The public were similarly receptive too. 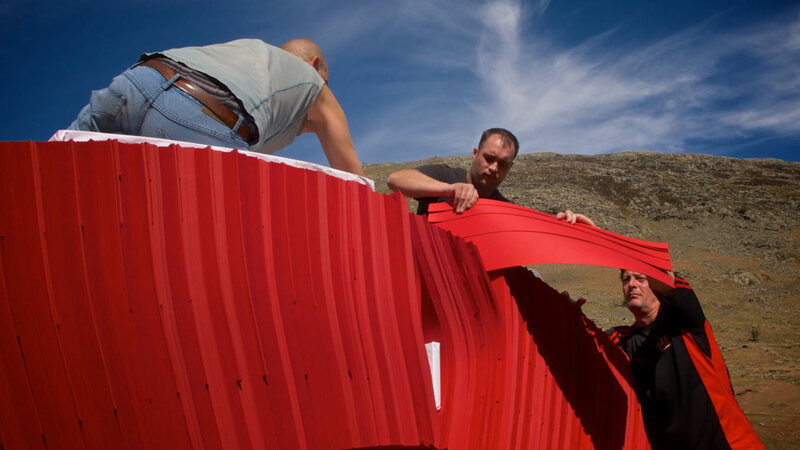 We were a little apprehensive as to how people would react to such a bold statement, but the fact that it was temporary, had a very light touch and used the surrounding landscape to become part of the work rather than challenging it drew visitors in their hundreds. We have no idea just how many people came to see it – we weren’t even thinking about that – but the local National Trust Estates Manager reckoned it was thousands based on the carpark use alone. We had no idea what the longer term effect would be. Nothing like this had ever been attempted in the Lake District. 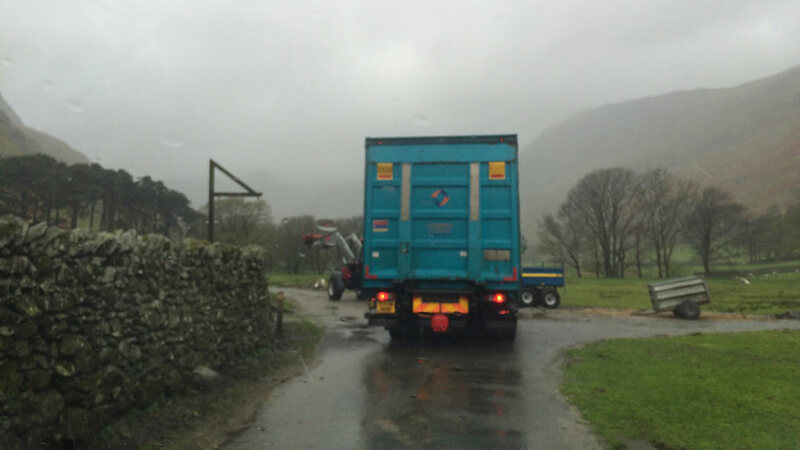 There was a perception of overprotection from major stakeholders like the National Trust and the Lake District National Park Authority. However, that the piece was successful and very positively received made it so much easier to do similar works in the landscape in the future. Certainly from where I stood it was the piece that created a significant mind change in those organisations. As landscape works go, this was very simple. 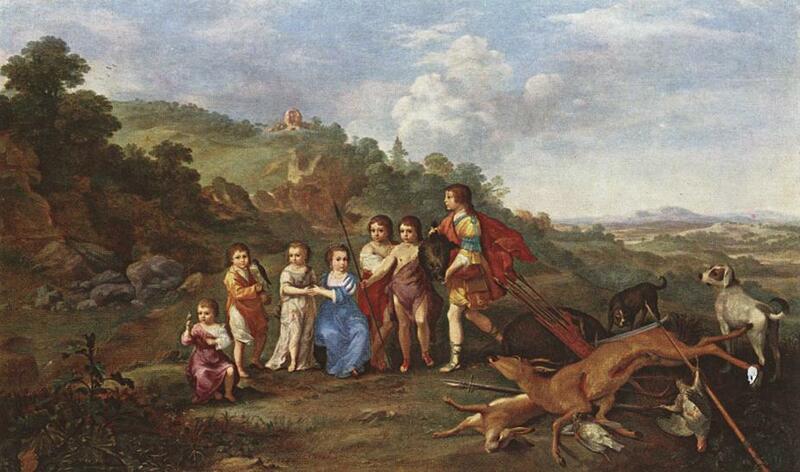 It was made with very little thought to a wider context or depth of meaning. In the wider scheme of things it’s not a great piece of art. This wasn’t the first piece I’d done outdoors or using the landscape, but in terms of scale it was a new benchmark. I was hooked and almost every piece I’ve created since has a direct link back to that piece. And it was 12 years ago today. Jean-Michel Jarre has a new album out. OK. I’ve got to start a blog post somewhere and it’s been a while since the last one so be gentle on me. But really. Jean-Michel does have a new album out. Predictably it’s all big synthesizers and arpeggios, only this time it’s collaborating with other big synthy people, like Tangerine Dream and Vince Clark and Moby and … er… Lang Lang.. Still, it’s predictably Jarre enough for me today. Jarre at his best is a serious musician writing big, complex compositions using electronic synthesised instruments. Hugely prolific – having recorded over 20 albums since 1972 and influenced generations of electronic musicians – he’s kind of the Mozart of electronic music. And like Mozart, he’s quite partial to a tune or two. In the 80’s he famously transformed his concerts into huge outdoor spectacles of light and sound. I’ve written about these in a previous post (a long time ago). For me, the transformation of city skylines as a backdrop for music has always fascinated me. 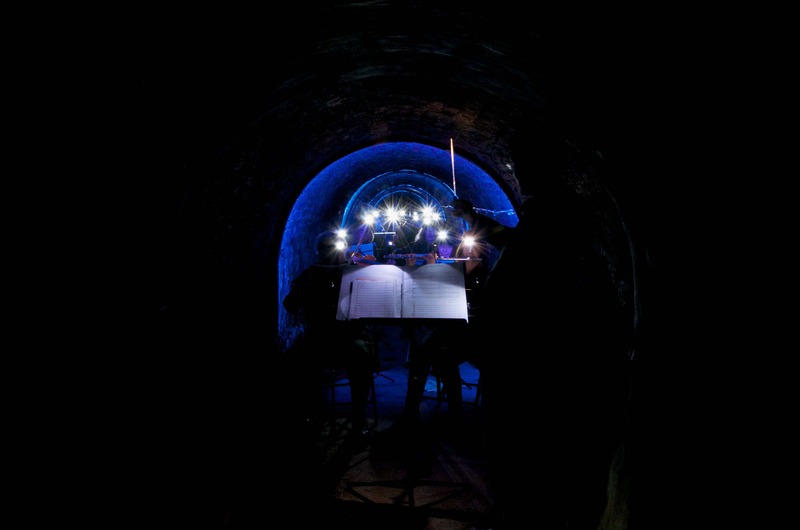 Last year I embarked on a collaborative project with one of the orchestras I play with to create artworks of music and light in underground spaces. The Cobweb Orchestra is an amateur organisation that allows musician of any instrument and ability the opportunity to come together and play in an orchestra. There’s a number of regular weekly groups across the north of England and the project wanted to do something that united the whole membership and explore the region. And what unites the region is the heritage of going underground. Be that mining or shelter or transportation. So the Underground Orchestra project was born to play the music of the north deep within the land of the north. An orchestra playing underground is interesting and unusual. 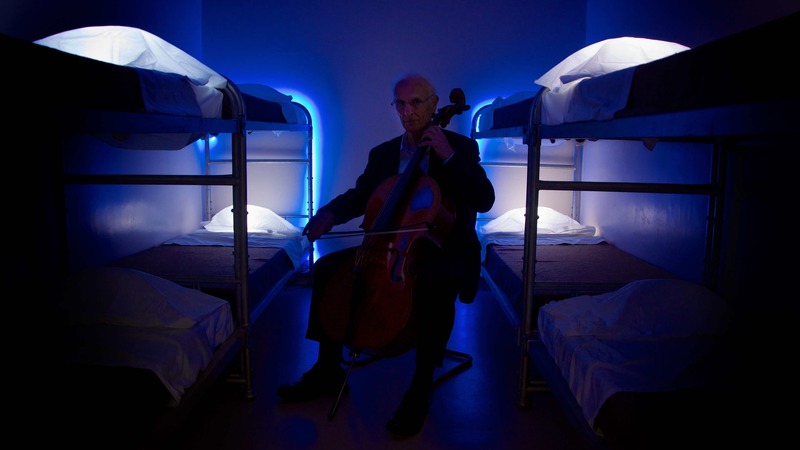 but an orchestra playing inside a light installation underground would be amazing and unique. The difficulty comes with doing something that relates to both the location and the music, but doesn’t over power either. I wanted to do something that wasn’t stage lighting or lighting design, but could stand alone as an installation in its own right, yet became something again when combined with an orchestra. Long before Jean-Michel Jarre there was Thomas Wilfred. Wilfred was born in Denmark in 1889. As a teenage he moved to New York and began experimenting with light as an artform. In 1919 he created his first ‘Clavilux’. A machine which through the use of mirrors and coloured glass, performed symphonies of light. Each composition was contained on a glass master disk so that in theory a machine could play different pieces. In reality, the machines were very different – each more advanced and complex. Opus 2 had its first public performance in 1922 to huge critical acclaim. In the audience that night was Leopold Stokowski – but more of him later. As purely analogue machines, the compositions have a quality and presence that I fear is somewhat lost on Youtube. The machines themselves included curved screens behind curved glass creating a unique three-dimensional effect. Wilfred was adamant that his light compositions were not filmed – he saw the quality of light as a distinct artistic medium – so the only compositions that remain are with the 30 surviving Clavilux machines. The quality of light and colour perception is a main component of James Turrell‘s work too. I think it’s difficult to work with light and colour and not be influenced in some way by Turrell’s mastery of the medium, although recently Drake’s music video for ‘Hotline Bling’ might have come a bit too influenced.. The great things about underground spaces is they are dark. really dark. The kind of dark where you genuinely can’t see your hand in front of your face. This means that whatever light you use, it’s pretty much going to be the only light. Of course there are issues that with an orchestra, the musicians are likely to want to see their music, which means some white light. But if you make a feature of that light rather than try to hide it, even the reading lights become part of the visual and part of the environment. 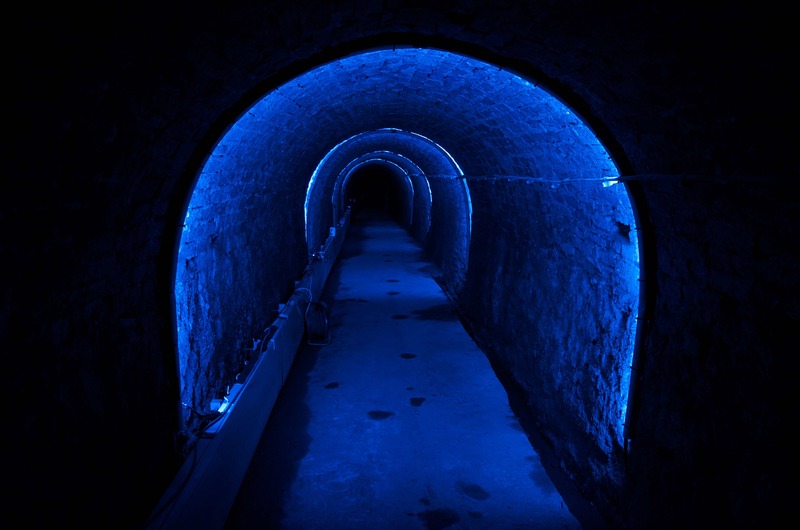 The first venue in October last year was the ‘Victoria Tunnel’ beneath Newcastle. The Victoria Tunnel was built to transport coal from the mines to boats on the river Tyne and runs right underneath the centre of the city of Newcastle. I wrote more about it last year. As the first of the events I was keen to find a voice for the future events. Somewhere between Turrell and ‘Fantasia’ is what I had in mind. Using mono-frequency lights to give me a saturated blue light to accentuate the Purkinje effect – the way things tend to look bluer under very low light levels and the way moonlight seems to be devoid of colour. By using LED lights I could strip away the rest of the spectrum as it just wouldn’t exist beyond the 465nm wavelength. It’s technical, and you don’t need to understand how it works, but when you’re in it it’s very different to seeing photos of it. The main challenge of the tunnel was the listed nature of the structure itself. This meant that I couldn’t physically attach anything to the walls. So instead I had to devise a way of keeping the lights in place purely by springing them against the walls using carbon fibre rods. 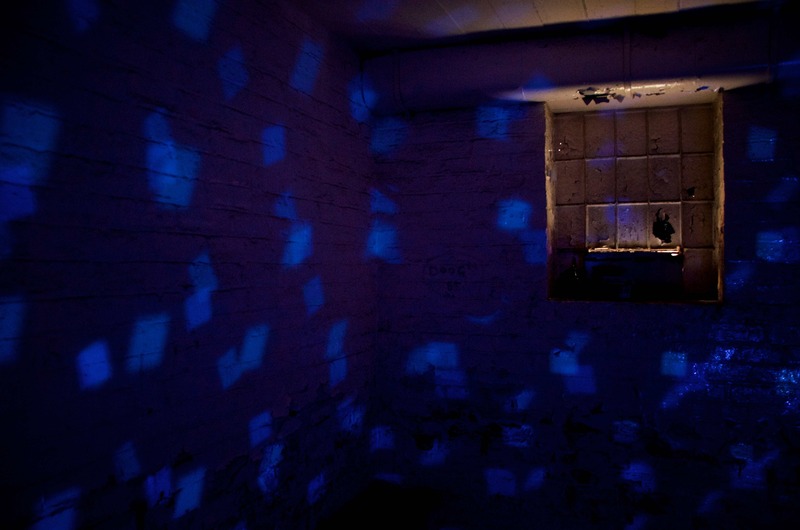 The restrictions were amplified at the next venue – the York Cold War Bunker. Built to monitor fall-out levels in the event of a nuclear attack the site oozes with the cold, steely fear of ‘the bomb’. As an English Heritage site, every last detail was listed. The very fabric of the building and every layer of paint on its surface had to be conserved. The solution to this was to filter the existing lights to create bodies of colour to set moods and define space. With such little time to install and so many rooms to transform, everything had to be as simple as possible. Still continuing the Turrell / Disney inspiration, each room had its own character. The depth of colour and its changes through the building added to the unsettling atmosphere of this Cold war relic. 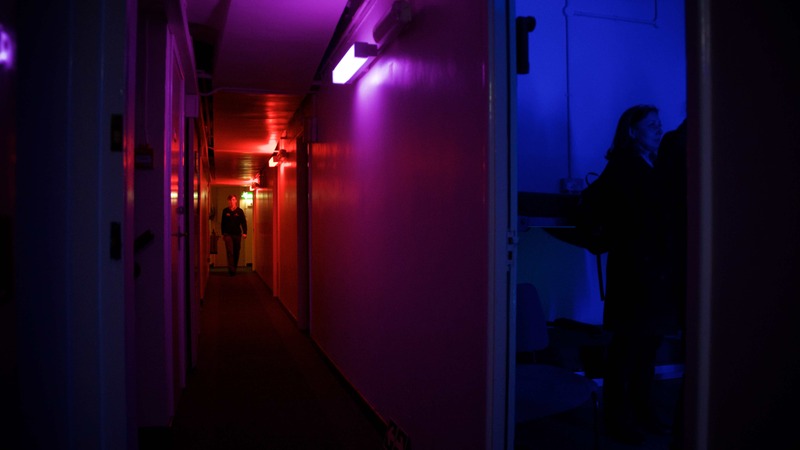 In the women’s dormitory I used the same blue light as the tunnel, but added sound responsive white lights. The normally dormant pillows would progressively wake and glow in response to the volume of the music being played in that room. The third location – the Cleveland Ironstone Mining Museum presented its own challenges. Again the prime factors were the number of spaces (three) and the relatively short install time. 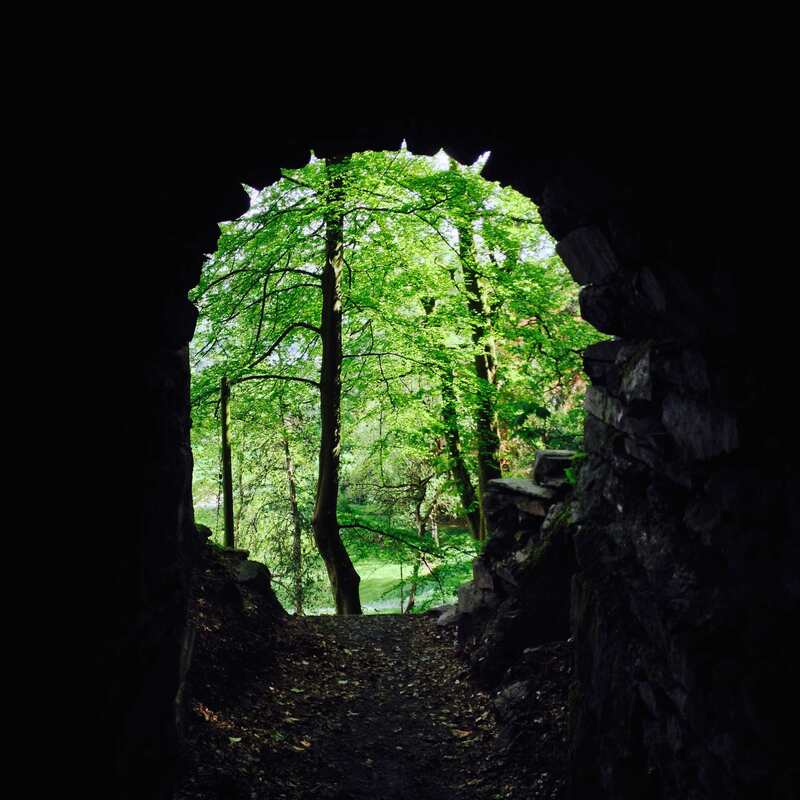 One of the spaces was a drift mine shaft – a brick-lined tunnel sloping down into the ground about 80 metres long. There was enough space for three musicians to play at the bottom. However, there was a limit to the number of people who could be in the tunnel at any one time. I somehow needed to convey what was being played to an audience who may not even be in the tunnel. For this I looked to Wilfred and his use of light as music. As it was a trio performing I figured they could be represented by the three primary colours of white light – red, green and blue. With each instrument linked to their own colour, the resulting projection would constantly change colour in direct response to the playing. 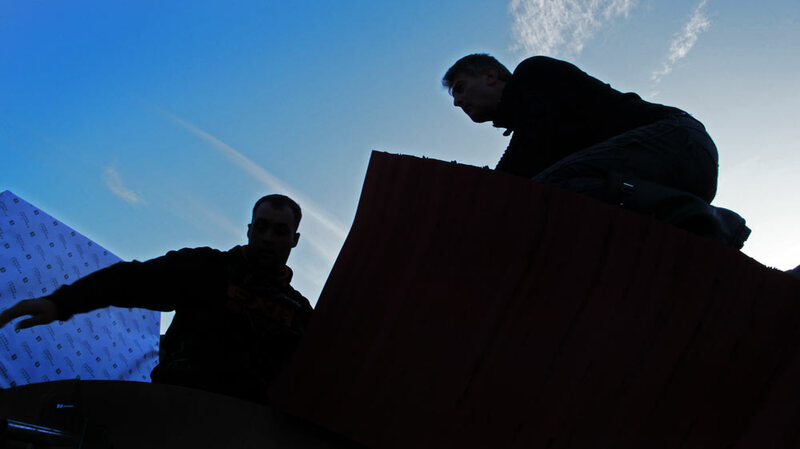 The next location was always going to be the centrepiece of the project. 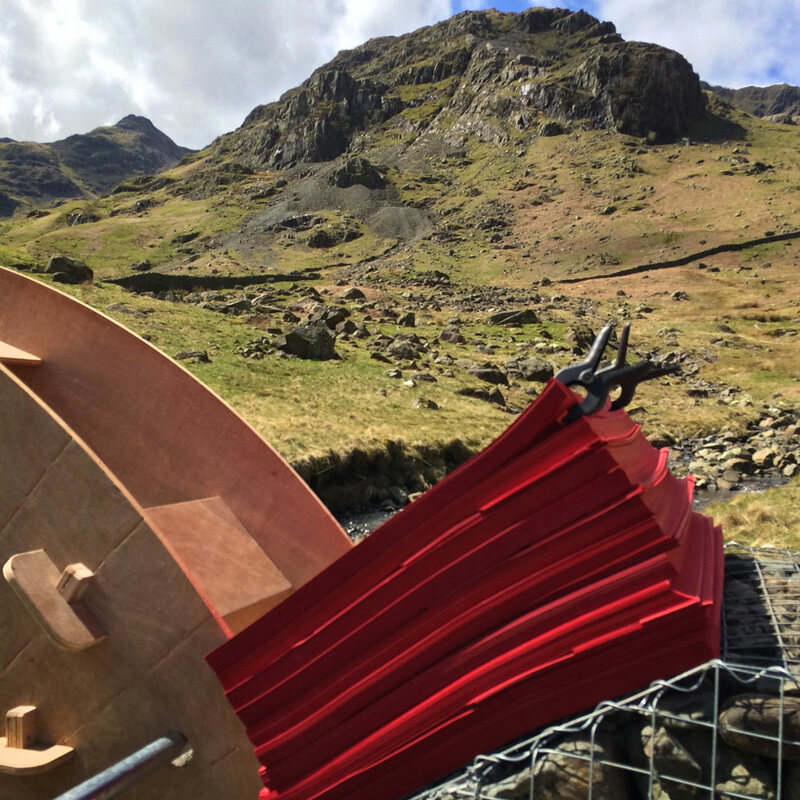 A full-sized symphony orchestra playing inside an iconic Lake District mountain. The space was vast – an old slate mine cavern deep within Fleetwith Pike at Honister. This would be the biggest orchestra of the project and at 80 – 90 people, the largest single underground audience. What was needed here was something on an equally grand scale. A few years ago, when my studio was in a drafty barn on Stainmore, I was playing with smoke machines for a piece on the gothic decay of light in the clouds for a conference in Lancaster. This meant filling the studio with smoke to test the piece. At the end of the day as the sun was setting, my eldest came to see what I was up to and ended up playing in the shafts of light as they came through the gaps in the barn doors. 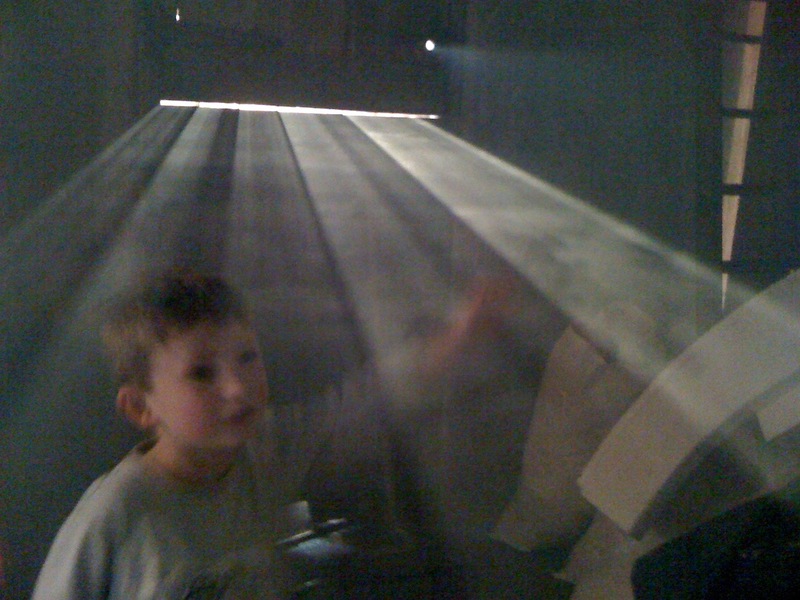 It’s all so very Anthony McCall, but I liked the way you could see on top and underneath these shards of light. They had a real presence to them. For the piece in Honister Mine I wanted to recreate those thin slices of light through the air – big flat, sharp slices in the way that slate is sliced cleanly down the grain. 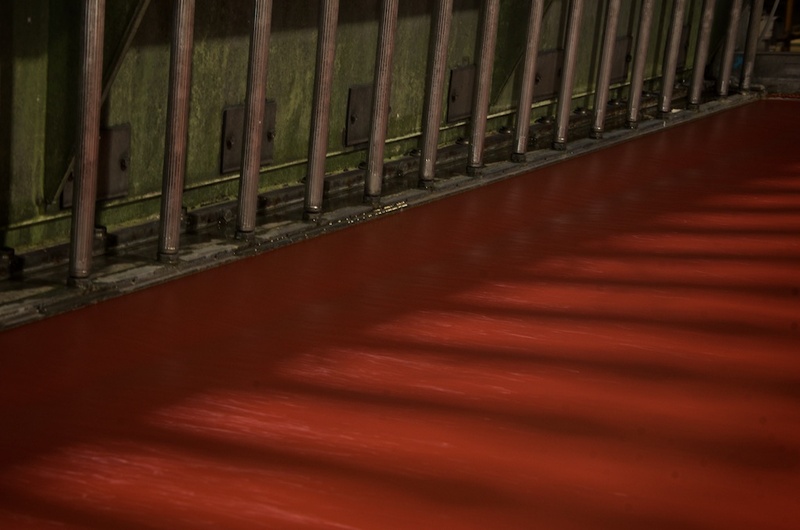 ‘Rive’ took weeks of development and testing to find the right light source for the right quality of light and the right sharpness of its edges. the installation inside the cavern alone took over a week. 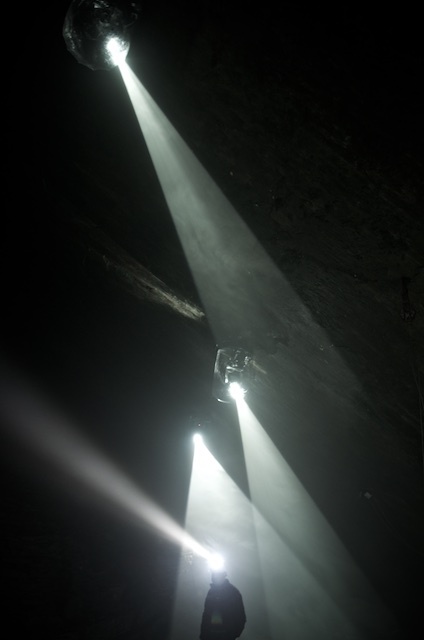 The final piece was a series of thin shafts of light from the roof of the cavern to the floor. 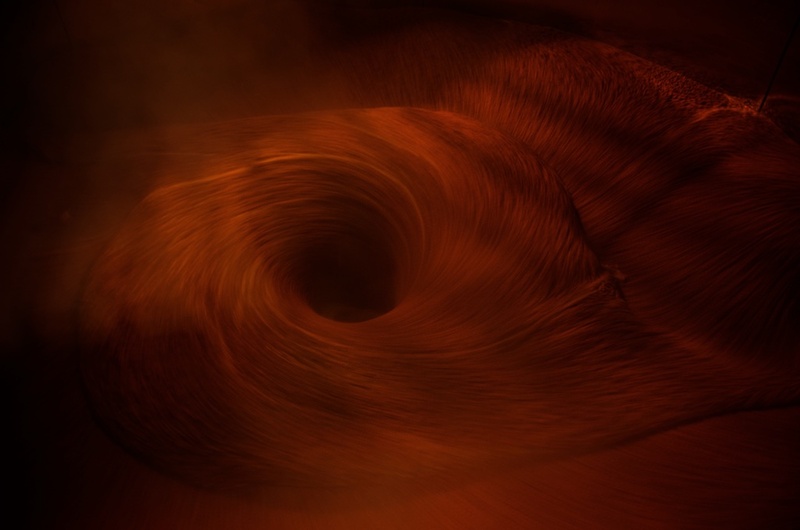 they had a solid, sculptural quality – you could look all around them and clearly see their edges, yet you could walk straight through them as if they were an apparition. Again this was a real experiential piece. No number of pictures or video really does them justice. By contrast, the final venue last week, was by far the smallest and most intimate. A single prison cell beneath the former town hall in Wallsend. THis was a very simple affair with musicians playing short 20 minute sets with room for no more than four players at a time. 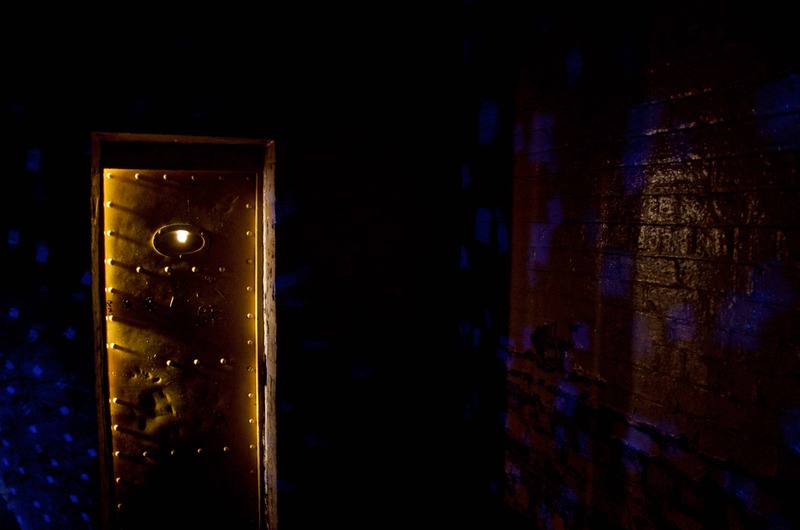 The cell door was kept closed and the audience could hear the music throughout the basement but could only see the players through the spyhole in the steel reinforced door. The Underground Orchestra was no Jean-Michel Jarre experience. But neither did it want to be. These were small-scale performances in mostly very small-scale spaces. But was interesting was looking at the relationship between music, musicians, light, scale and location. The music was a key element – a wonderful programme of music from the Northern counties – historical and contemporary. Beyond being an investigation of the cultural heritage of the north, for me this was as much about exploring the landscapes that I live within. There are many sides to landscapes. The underneath one was fun. 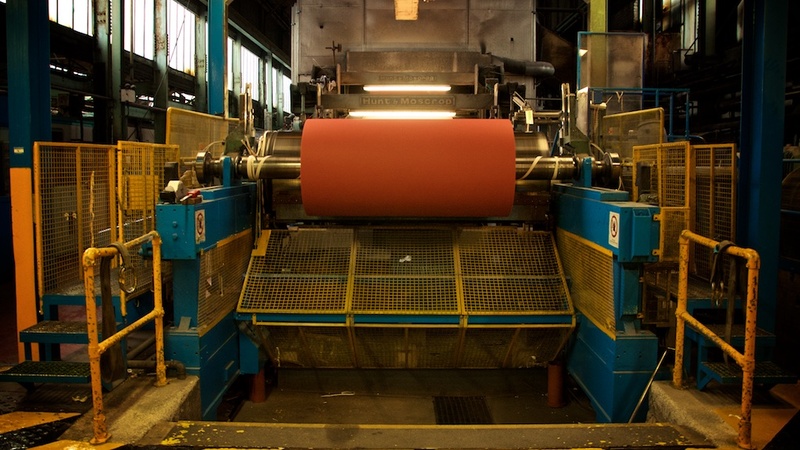 Last week I went to see the paper from the bridge finally get pulped and recycled. 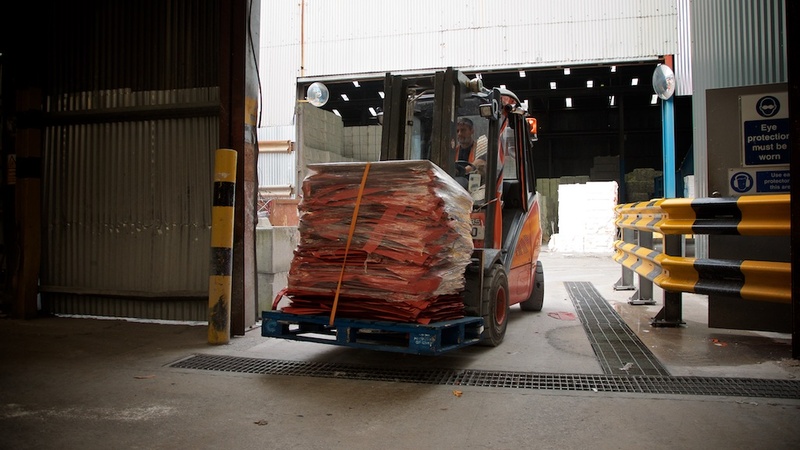 Half-tonne bundles of the now sun-bleached red paper were carried into the pulping shed at the paper mill on a fork-lift before being unceremoniously tipped onto the conveyor belt that started their journey of rebirth. It wasn’t so much a desire to see the destruction of the last bits of the bridge, but more out of interest to see just how simple the recycling process was. Paper is such a basic material. At its heart it’s just a mass of fibres lying randomly on top of each other. They’re not even woven together. The fibres just lie in a general direction that dictates the way it curls when dry. 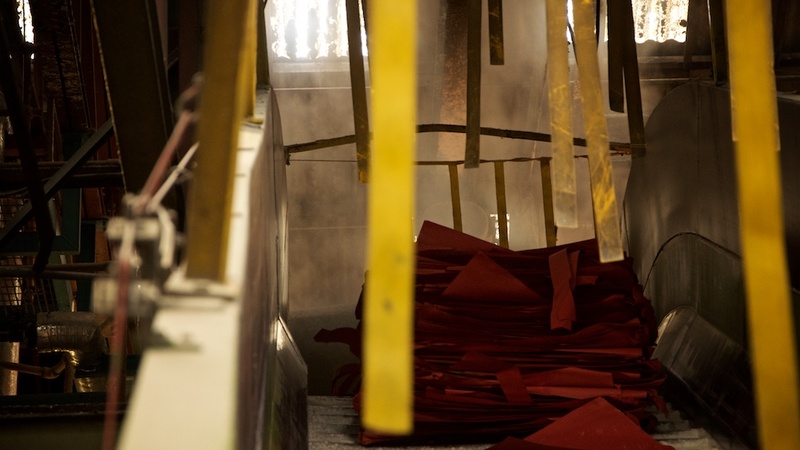 Recovering the fibres from used paper is just a case of tipping them into a giant blender where the sheets are shredded by rotating blades and mixed with warm water to help soften everything. 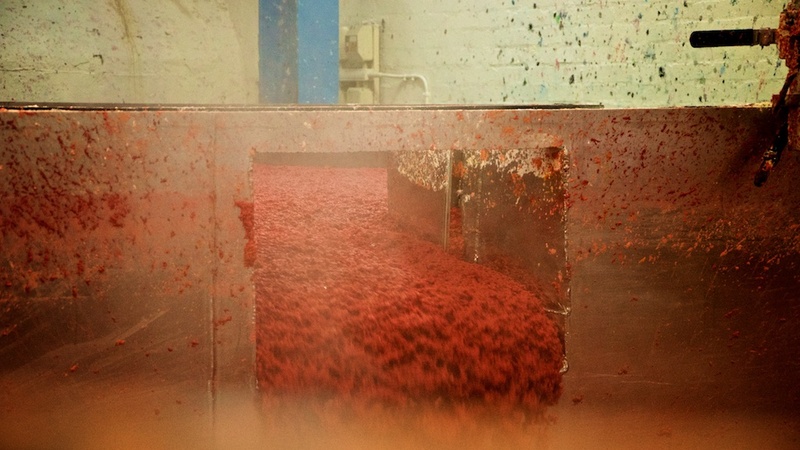 The entire process, from conveyor belt to reel of finish product, probably takes about an hour, plus some pausing time for colour matching and keeping up with the manufacturing process. For me this was very much an end point to the project. Or at least the physical existence part of it. There’s something about this project in particular that seems to have made a connection with so many people. Two months on from building the stone gabions, I’m still getting daily requests from picture editors and journalists around the world running stories about the bridge. Back at the launch day six weeks ago there were no journalists. No photographers. Our perfect timing had meant unveiling the bridge the same day as the results of what everyone though would be the closest general election in decades. 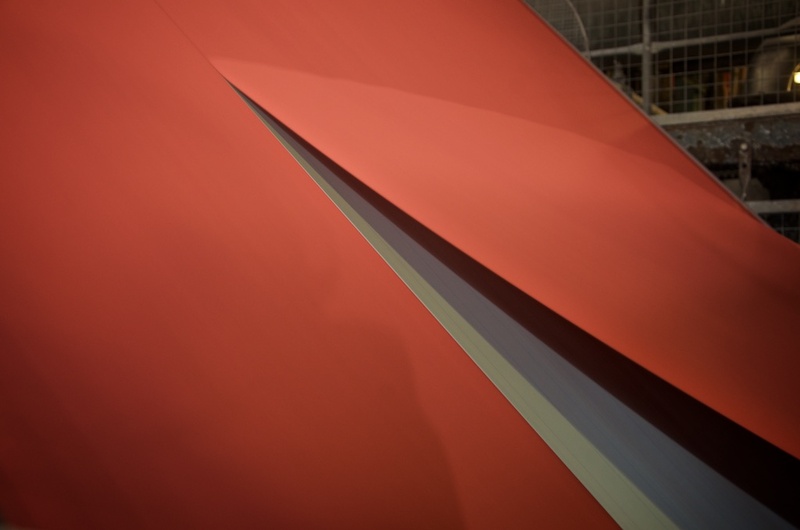 Beyond politics and the UK, it was also press day for the Venice Biennale – the largest art event in the world. In PR terms we couldn’t have picked a worse date. To top it all, in the craziness that was the tight schedule, we only put up three A4 posters to tell people it was happening. That anyone turned up at all, on the face of it, was nothing short of a miracle. Actually, it wasn’t a miracle. 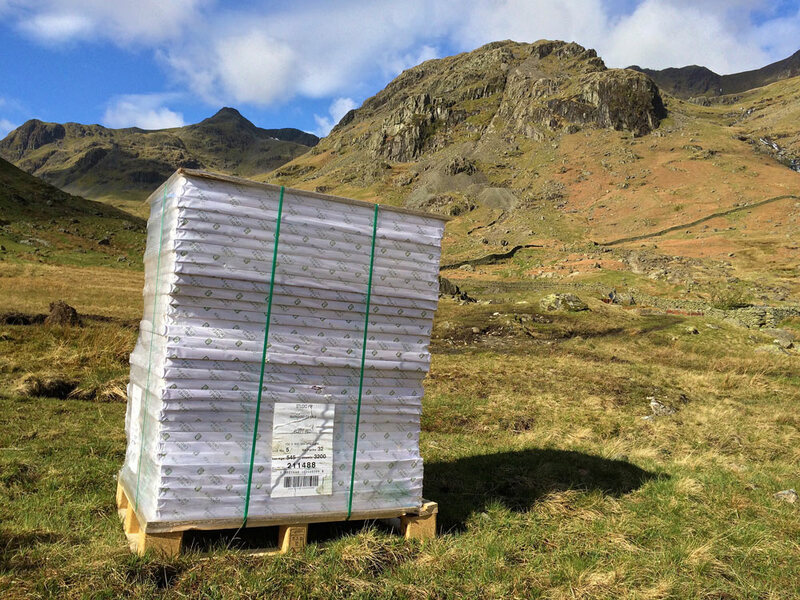 It was the result of weeks of determination and hard work by the marketing and press teams at both Cumbria Tourism (one of the main partners in the the funding consortium) and James Cropper – the paper manufacturer. What started off as some solid coverage by local press and TV in the lead-up weeks, grew rapidly after the opening weekend. As the political stories became old news picture desks were desperate for something light and positive. By the Monday the pictures by North News’ Paul Kingston had made the Times and the Daily Mail – including the Mail Onine – despite its questionable ideas about what constitutes news, it’s still the largest online news outlet in the World. By the Tuesday the online design publications had got hold of the story and were running it on their front pages. 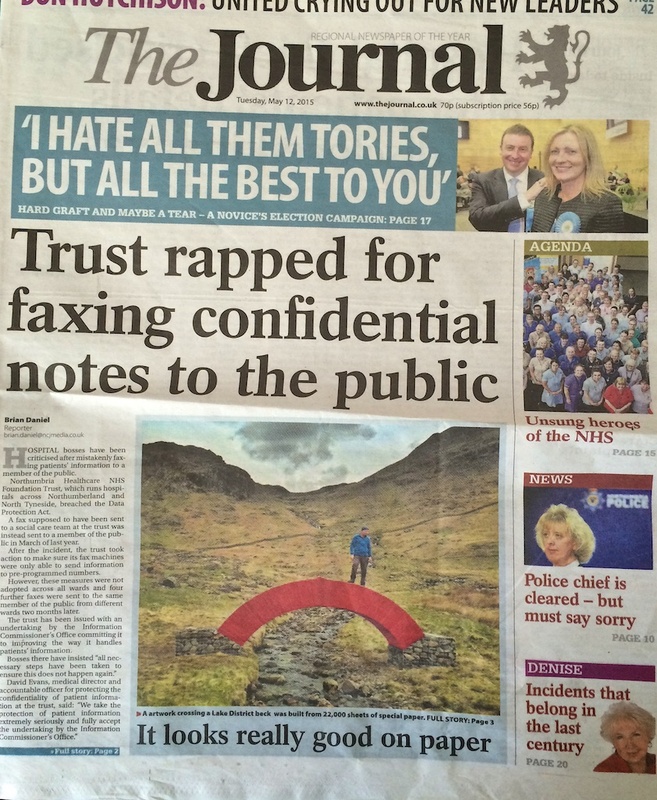 As did the Newcastle Journal. By Wednesday my email inbox was constantly full with requests for info, interviews and images coming in faster than I could reply to them. My twitter feed was constant with reports from people visiting the bridge and posting pictures all over social media. 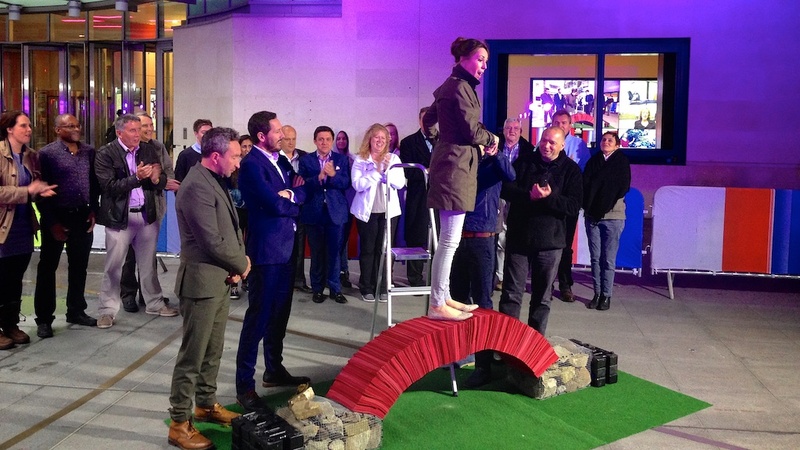 On the Thursday I was in London for the day (no mean feat from where I live) and building a 1/4 size bridge out of A4 paper in front of broadcasting house and appearing live on prime time BBC TV. 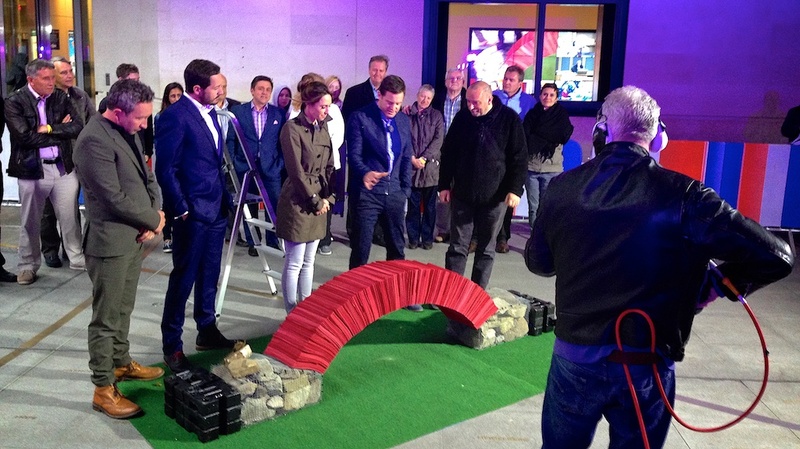 presenter Alex Jones tries out the model bridge on live TV! On the Saturday I had the day off to do another little installation in Yorkshire. I’d seen some pictures on twitter of crowds at the bridge on Saturday, so on Sunday – the penultimate day of the bridge, I thought I’d go down and see for myself. It’s a tidy walk up to the top of Grisedale from Patterdale. It’s not a difficult walk. The first part just follows the lane up from the village. The steepest section is on tarmac so it’s not that steep really. By the time the road runs out you’re about halfway there. Once past the last farmyard with the newborn cattle the track becomes a rocky path and the landscape is noticeable wilder. Where it opens out again at the head of the valley the bridge suddenly became very clear. Sitting in the first bit of green beneath the craggy backdrop with Nethermostcove Beck tumbling over falls on its way down. A feint boggy path diverges from the main valley path at this point towards the wooden bridge over Grisedale Beck. This is the wettest and muddiest part of the journey. One wrong footstep and the black peat is halfway up your shins. I dread to think how many trainers were waterlogged on that last bit. The main path is a popular path in the Lake District. It’s part of the Wainwright Coast to Coast path, and a starting point for those heading up Fairfield, St Sunday Crag or tackling the mighty Helvellyn. 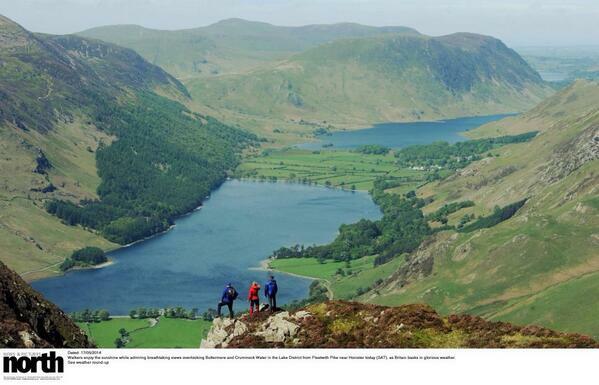 The Lake District is a busy place for walkers and you’re rarely alone on any of its miles of well maintained paths. On a typical sunny weekend you’ll probably pass twenty or so other walkers on your way up from Patterdale. On that Sunday I passed 200. That was my first clue as to how busy the bridge was. It wasn’t even a great day for a walk. It was windy and the wind was bitingly cold – particularly up at the bridge where the prevailing winds come off the mountains behind – still with their crests of snow on the top. My works are all about the audience experience and I like going to see how people are experiencing them. There’s something nice about going back on my own and mingling with other people to try and see it how others do. It’s also nice that I can usually go without anyone knowing I’m the artist so I get to find out what people really think rather than the polite responses you get on surveys or on guided tours and artist talks. From the day it was finished, the bridge was never all that quiet. I’d visited a number of times over the week for various reasons and at different times of the day, and I was rarely on my own there for long at best. One morning I set off at first light to get the early morning sun picking out the bridge against the crags. When I arrived there was already a few others doing the same, including one keen photographer who’d set off from Ashington at 4am with the same idea. Earlier in the week we’d been up doing some TV interviews until gone 7pm and still people were wandering up the valley to visit. Yet, on that final Sunday morning the crowds were still an unexpected surprise to me. There was a constant stream through the field gate, people in the beck getting photos, families on the outcrops having picnics. At one point there was even an orderly queue of people from the gate up to the bridge with people wanting to walk across it and have their selfie moment. It was all very civilised and good natured. Everyone was clearly enjoying the experience. The demographics were across the spectrum – families with small children, seasoned walkers, older people out with the dog, fell runners, mountain bikers. But lots of people just out in their (very muddy) trainers. And every one of them had made the two-mile walk out on foot. you don’t get more British than that – queueing in the middle of nowhere. in the rain. More than that. 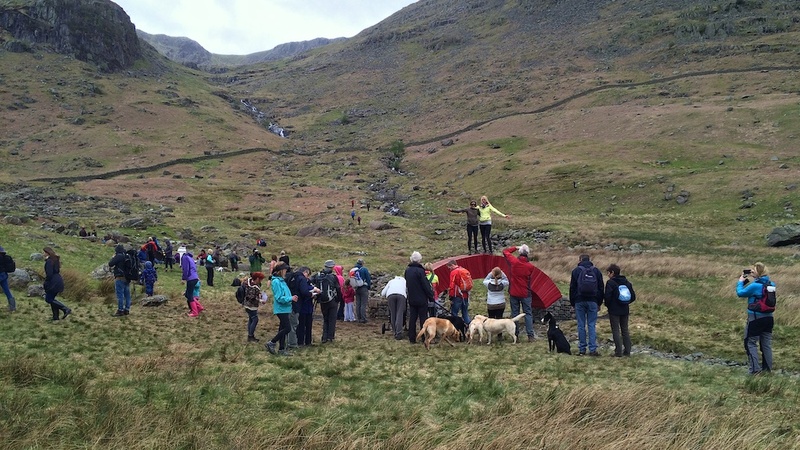 Every one of them had travelled to Patterdale and then made the five mile round trip from the car park. Even for people in ‘nearby’ Kendal or Penrith, that constitutes a four or five hour commitment to visit the bridge. To engage with art. Many travelled much further. There are very few galleries in the world who can claim to match that from their visitors. A few figures for you. Patterdale is home to around 400 people – including the surrounding hamlets. 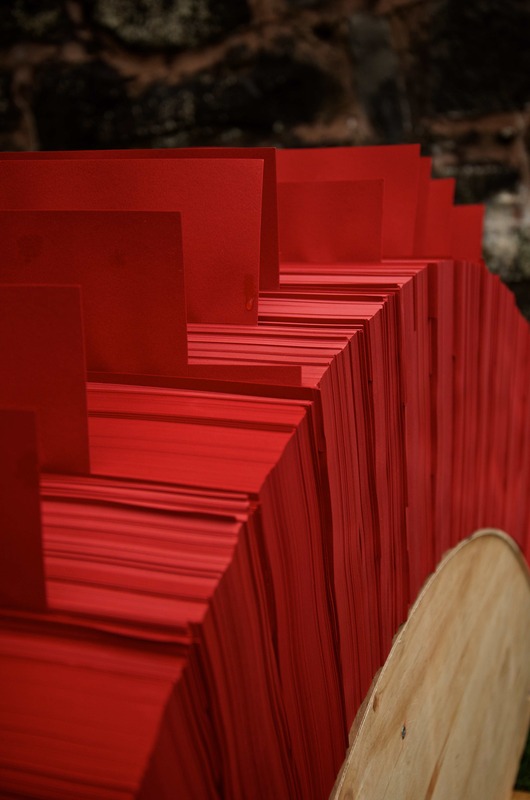 Over just 11 days, around 8,000 people visited the PaperBridge. Most of them crossing it and taking pictures. Pictures and stories about the bridge appear in magazines, newpapers and online publishing in every continent. To date over 44 million people have read an article online, seen a picture in a newspaper or watched a feature on TV about the bridge around the world. Twitter and Facebook were full of photos of people standing on the wobbly top of the bridge in all weathers. In ones, twos or more. I saw one with seven people crowded on. A local holiday let company even posted a picture of their MD drinking a cup of tea on the top. That’s a fair way to drag a dining room chair – total commitment! As well as spreading the word and engaging people with the project, social media played a major part throughout the project. Every morning when I woke I checked my social media streams for pictures to see how the bridge was holding out. Particularly comforting in bad weather. Almost everyone involved got there via connections on Facebook and twitter. When my email inbox got unbearable communication was done via direct messaging on Twitter. Tracking the #PaperBridge tag alerted us to media stories around the world we otherwise would have missed. In turn, those social media connections have opened up whole new avenues for me to explore. It’s been one heck of a journey these past few months. 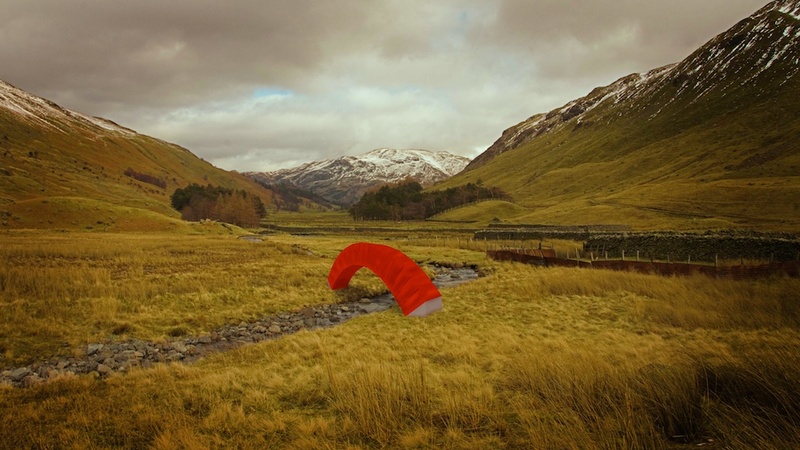 That bright red arch over a remote mountain beck is no more. While it was there something magical happened and it reached so many people. That it was only there for a short while keeps that memory special. It’s now just a story. And stories are the longest lasting of anything. 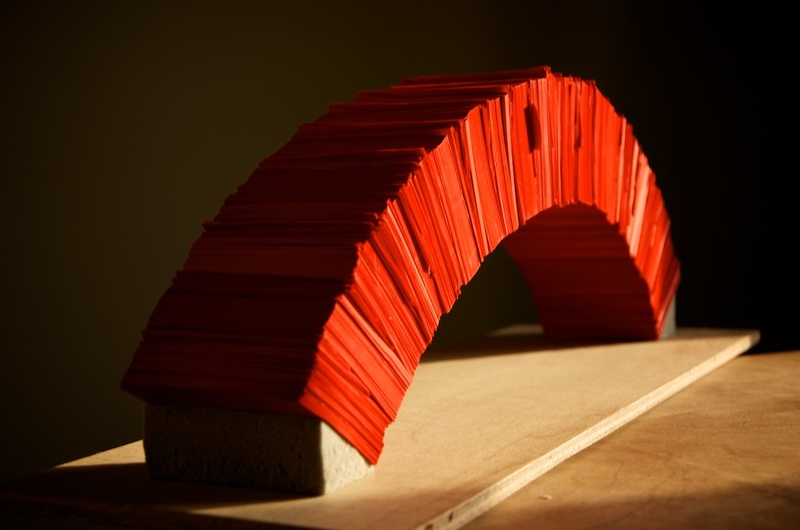 The idea of building a bridge out of paper goes back a little while for me. It’s been one of those projects that’s been sat on the back burner so long it was in danger of completely drying out. And if it wasn’t for a random DM on twitter one Sunday evening, it might still be there. 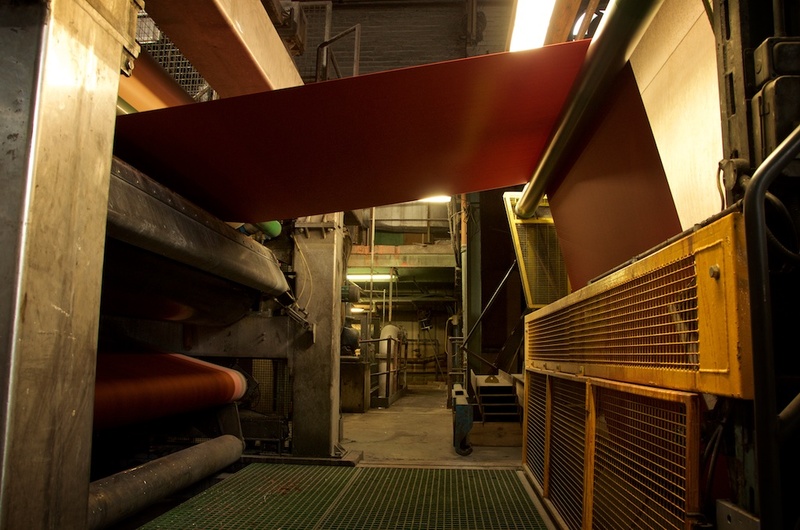 It was some years earlier that a discussion with some of the lovely folk over at James Cropper – a paper manufacturer based in the Lake District – turned to thinking “what could be made out of paper?” At the time they were interested in pushing their brand values of bespoke production, colour and environmental credentials. We’d done some pieces for trade fairs and I’d started doing some small-scale temporary pieces in the landscape for photographs. The thing about brainstorming is that you can come up with ideas and not worry about how practical or realistic they are. I think I said it would be great to do something structural – like a wall, or a building, or a bridge.. or something along those lines, and that’s often how so many of my pieces start life. I open my mouth without thinking, and as soon as I’ve uttered the words they somehow echo and linger. And I start to dwell on them. Yes, a bridge. That would be amazing if we could do that. Obviously I had no idea how to do it, but the idea seemed to stick. 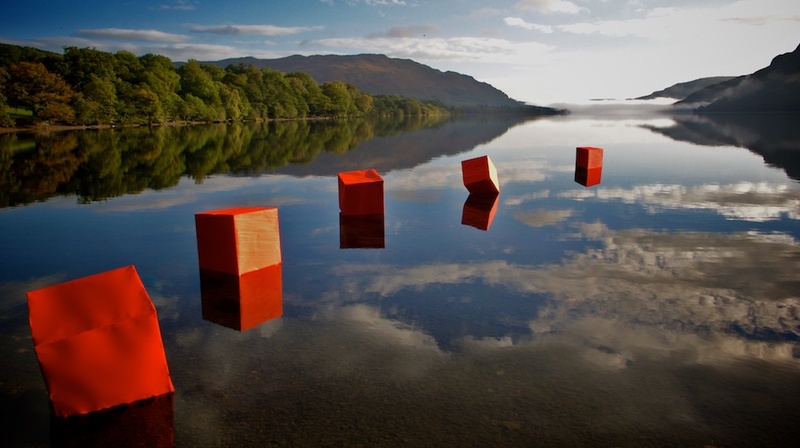 red paper boxes on Ullswater. 2010. Of course, when I started to look at it and do the research I discovered it wasn’t as left field as I thought. 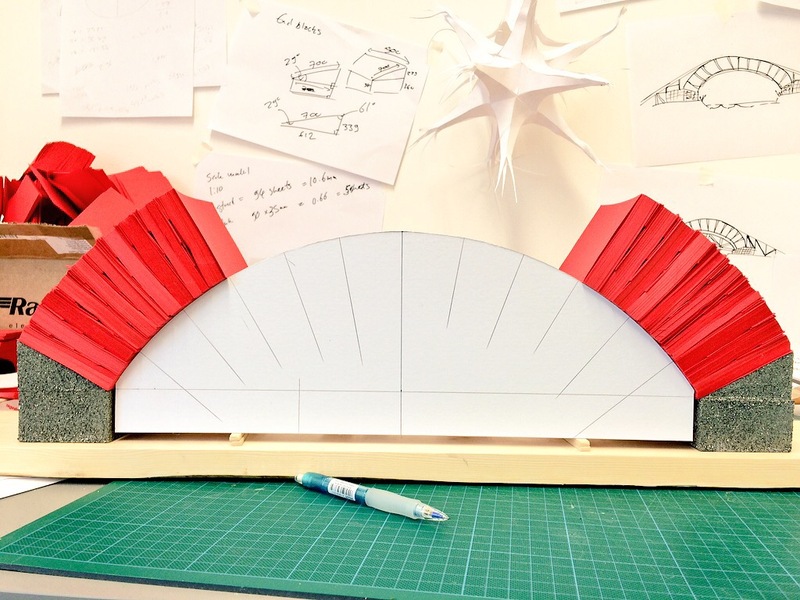 Building a bridge out of paper was a standard year one exercise in architecture courses all over the world. An exercise in creating strength from lightweight materials. These however were just models even though some could take the weight of people. Then there’s the work of Japanese architect Shigeru Ban. 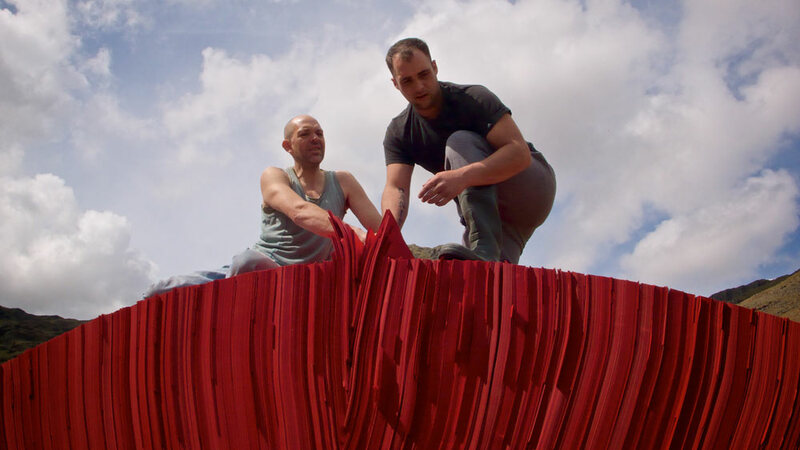 In 2007 Ban built a full-sized paper bridge over the River Gard at Remoulin in France. Ban had gotten over the structural and scale issues by using paper tubes. 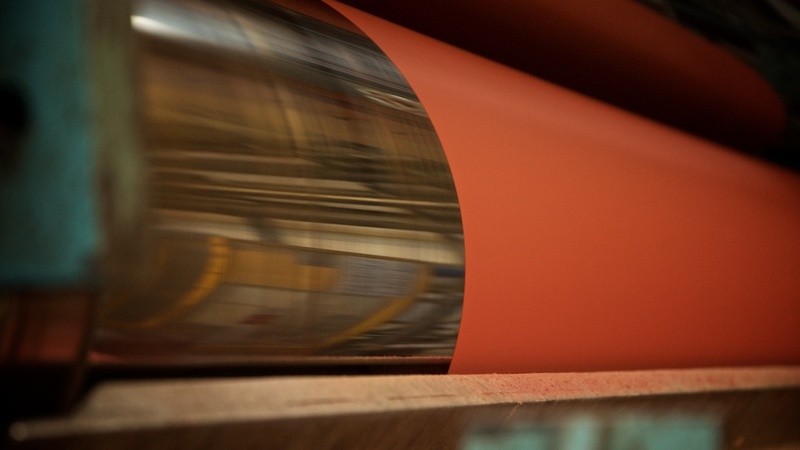 Paper tubes are an inherently strong but lightweight form and work well in both compression and tension along their length. Fabricated steel joints hold everything in place. However, I wanted to do something in just paper. I wanted the purity of a single material. This idea that something as seemingly fragile as a single sheet of paper could be the building blocks of something substantial.Something of real structural integrity. 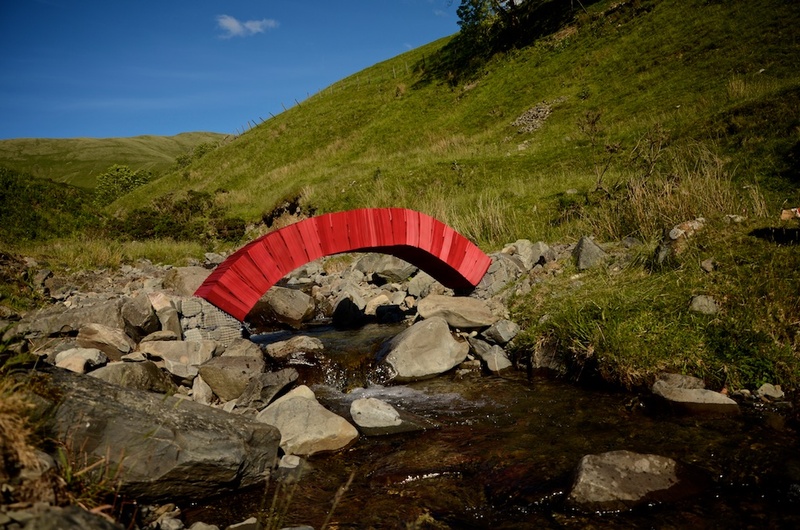 Capable of withstanding the Cumbrian weather and strong enough to function as a footbridge. 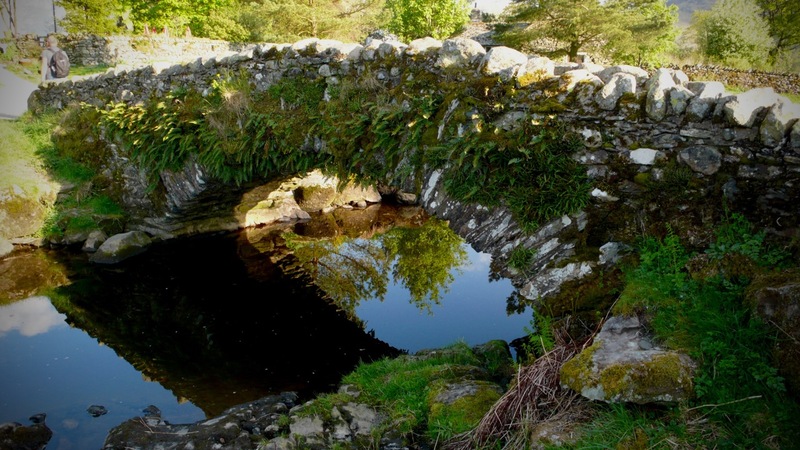 The solution lay in some of the earliest bridges in the Lake District – packhorse bridges. In the days before roads trading goods were moved across the country by packhorse – loading up horses and trekking them in convoy across the land. With no wheels to get stuck in mud it was a very versatile way to move things across difficult terrain – as in the case of the Lake District. Where rivers ran too fast to safely ford, simple stone arch bridges were built. Originally these were very basic, using local found stone and built over a wooden formwork, using lime mortar to cement the stone together. 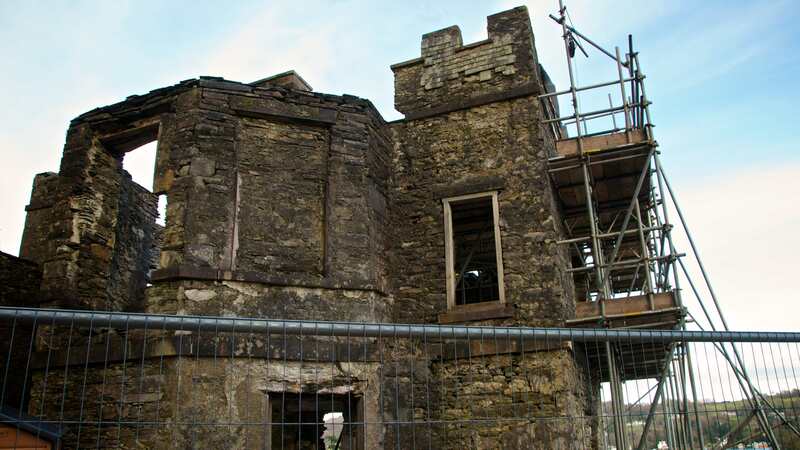 Once constructed the formwork was knocked down or burnt leaving a simple arch. There was no wall on either side of the pathway as this would restrict the size of the packs on the horses. The bridges were also used by drovers moving sheep to and from markets. Only when the tracks were upgraded and carts and waggons started to use them were sides added to the bridges to stop them from falling off. Carts also meant bridges had to be wider and more substantial with easy gradients up to the top, whereas the original packhorse bridges were frequently steep arches and only three-foot wide. 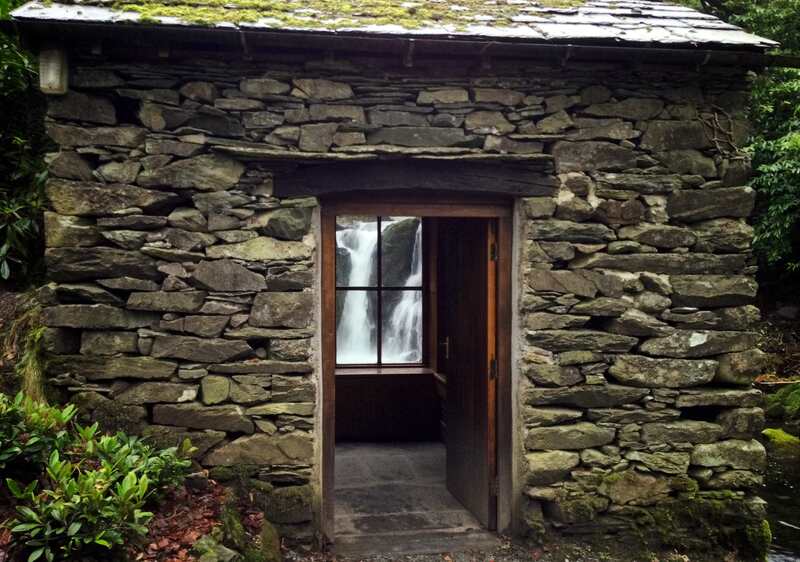 I found a great book – ‘An Illustrated Guide to The Packhorse Bridges of the Lake District‘ by Michael Hartwell, and set off to familiarise with bridges in the Lake District landscape. The construction of a stone arch is very simple and dates back thousands of years. Wedge-shaped stones – or voussoirs – are laid over a former. The final, topmost stone – the keystone – effectively holds it all together. In a paper bridge, all the stones are just pieces of paper. Structurally, the internal angles of the wedge shapes result in the vertical force (the load on the arch) being transferred to lateral tension (sideways force where it meets the ground). 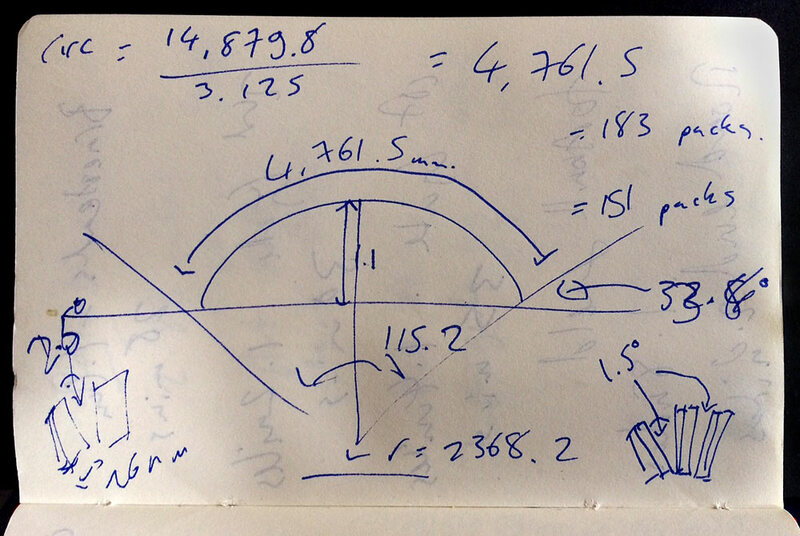 I could calculate how to build it on paper by simple geometry. If I knew the size of the blocks of paper and the radius of the arc I could determine how many ‘sides’ a polygon of those blocks it would take to go across the arc. Knowing the number of sides I could also work out the angle between them that I needed to fill with wedges. As I knew the dimensions of those wedges from the paper size I could work out the size of stacks of different sized pieces it would take to bridge that angle. I needed sufficient different sizes to brace across the gap evenly and also get small enough pieces to get as close to the upper edge as possible. The strength in the arc comes from ensuring the blocks are tight on the bottom edge and are wedged tight across the top edge. It’s also important not to make the mid-sized blocks in the wedge too big as, under load, the bridge would have a tendency to pivot on those points and make it rock. When it came to the bigger models and the final piece, those small packs of 10 or 11 sheets were critical. 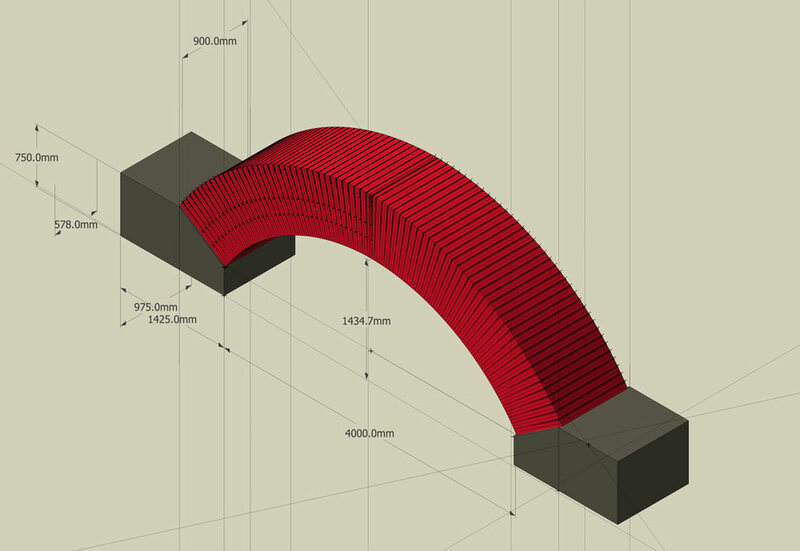 One too many small pieces of paper in one of the wedge sections might not seem much in the 20,000 pieces of paper scheme of things, but an extra sheet in one block equates to 150 sheets over the whole arch – approximately 40mm – and the whole bridge becomes very unstable. 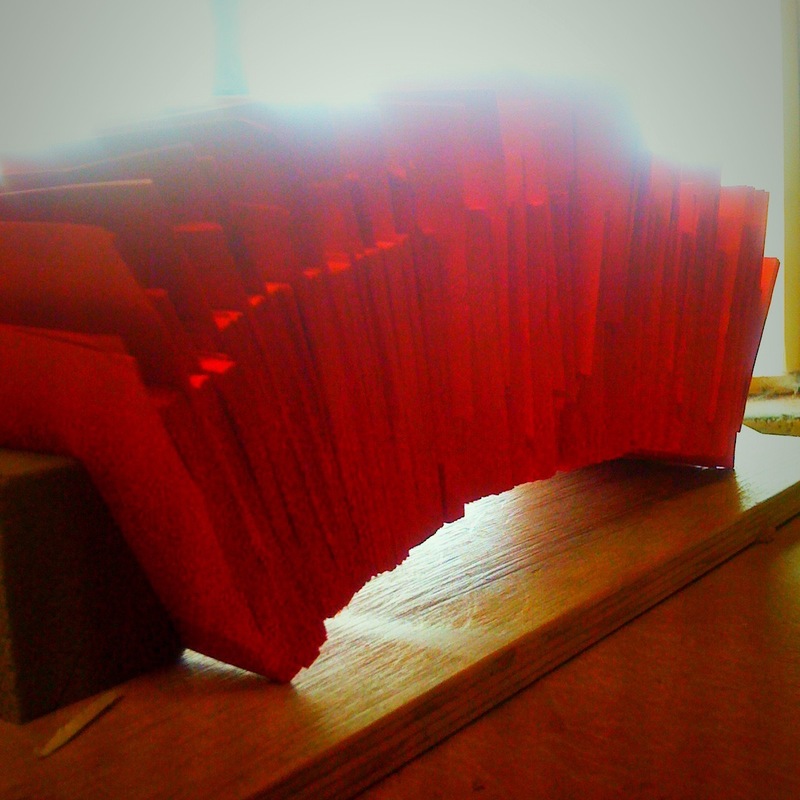 I think I built the first paper model bridge in 2011. It was very haphazard but it worked and held a fair weight. It was quite a shallow arc made by stacking small pieces of paper over a former and then wedging other sheets in a various intervals until it stayed up. The next model was more refined. I knew then how it worked. Using small pieces of paper left over from a project years before it easily held more than its own weight. By this time it was looking like this just might be possible. I’d even found a location where I thought it would look right – with big Lakeland fells around it, a fast flowing beck underneath and footpaths on either side. There was no point building a bridge that didn’t go anywhere. But, could I build one that would take the weight of a person? And how would it work outside? What would happen when it rains? Only one way to find out. Build a bigger one. Croppers kindly supplied me with a quantity of paper cut to approximately A4 size. From these I trimmed smaller sizes to make wedge-shaped stacks. 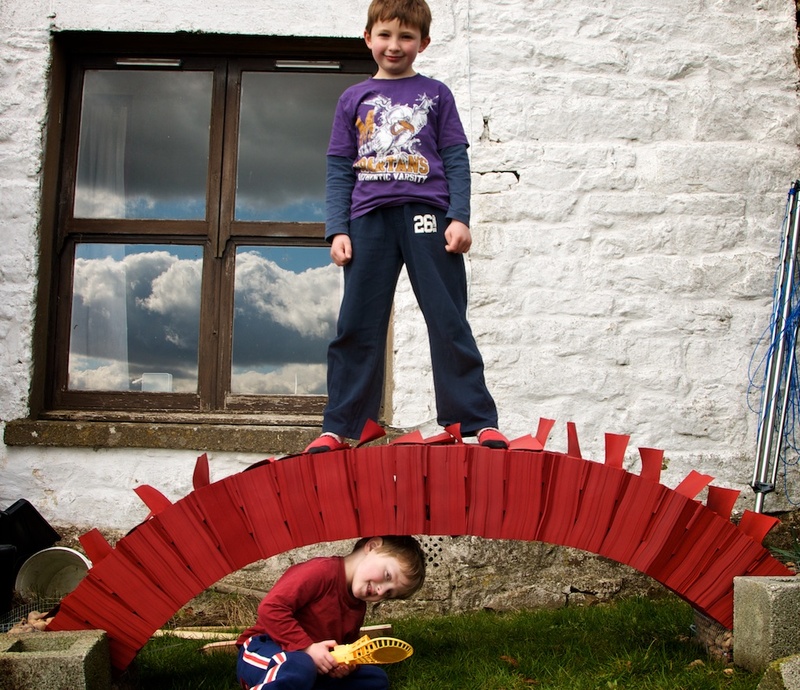 I built this first decent-sized bridge one evening in my front garden. I left markers at intervals so I could take it apart again and keep the paper in blocks. It was March when I built that, so it was getting dark early. I got it all assembled to a certain point and left it until the morning to fine tune it. Overnight the cloud came down and it was a bit misty in the morning. I just needed to move some of the blocks and add a few more wedges I thought to make a better arc. It was then I discovered what happens when the paper gets wet. The bridge was rock-solid. There was no way I could easily take sections out. When the paper got wet, the fibres swelled. As all the paper was in compression all the swelling pressure went against the abutments as it had nowhere else to go. I left that test bridge up outside the house for nearly three months in rain, snow and occasional sunshine. It didn’t go anywhere. The next test build was in the Howgill Fells overlooking the M6 Tebay Gorge. This was the first one over running water. It was a blistering hot day and there wasn’t much water coming down the beck, but I wanted to see how it worked in a more real landscape environment. The colour was a bit cold against the foliage and the bridge seemed to flatten out at the top, but this is what test are for – to find all the problems so they can be solved before you go for the big piece. From this point on the project hung around for a few years. 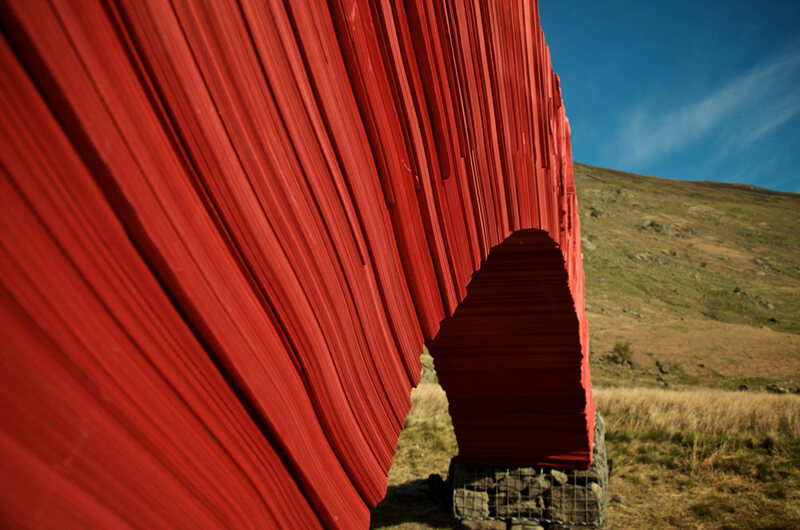 Both the paper manufacturer and the Lake District National Park were keen to help realise the bridge, for one reason or another things never quite came together at the same time to make it happen. I’d been showing mock-ups of the PaperBridge in presentations and lectures around the world for a few years. It was always something I used to show my working methods and the potential for public / private enterprise. It aways went down well too – there was something about it that caught people’s imagination. Whether that was the bold use of colour in the landscape, or the ambition, or the engineering. Earlier this year I was surveying my growing list of unrealised projects and looking to see which ones I could look to finally get done this year. Looking at how progressed the idea was and what was needed to actually bring it to fruition. The PaperBridge seemed to be pretty much there. It was all designed, engineered, tested, materials sourced, legal and health & safety implications sorted. It even had a location and permissions. I’d even gone through the PaperBridge as an example project when I met with Wolfgang Volz over the winter. All it needed was some money for materials and build costs. Although that doesn’t sound like much, finding funding is always more work than you think, so I pencilled it into my diary as something to start working on in the summer. A standard delay tactic. So when that random twitter message came through asking if I was interested in doing something in the Lakes, the timing couldn’t have been more perfect. Here was a client looking for something high-profile and ambitious in the Lake District landscape, and I just happened to have something all ready to go. Just as well as the proposal would need costing up and presenting in 10 days, and if successful, delivered in just 10 weeks. Under any normal circumstances that would be just impossible for a project of this scale. I don’t normally put proposals forward to open calls – coming up with project concepts, working out all the logistics and drafting up a budget alone can be a huge amount of work with no guarantee of anything coming off it. In fact I’ve never had any commission come off this way, so I stopped doing it. However, I had everything just sitting there, ready to go – although I had no idea how much it would cost, but sure I could do it within their budget. If only just. it was worth a shot. 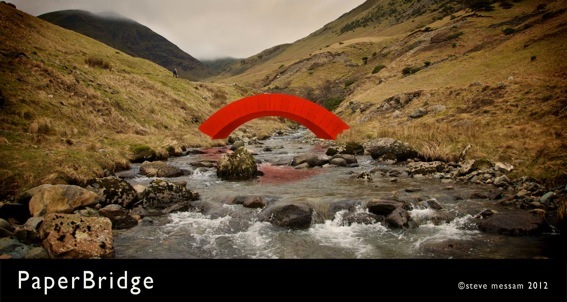 On the 22nd February I got an email inviting me to realise PaperBridge as part of a new cultural event in Cumbria and the Lake District – Lakes Ignite. The lead-in time for the paper production and my other work commitments meant there was just a 10 day window it could be done in during May. So that was it. Ten weeks to deliver a full-sized bridge out of paper. 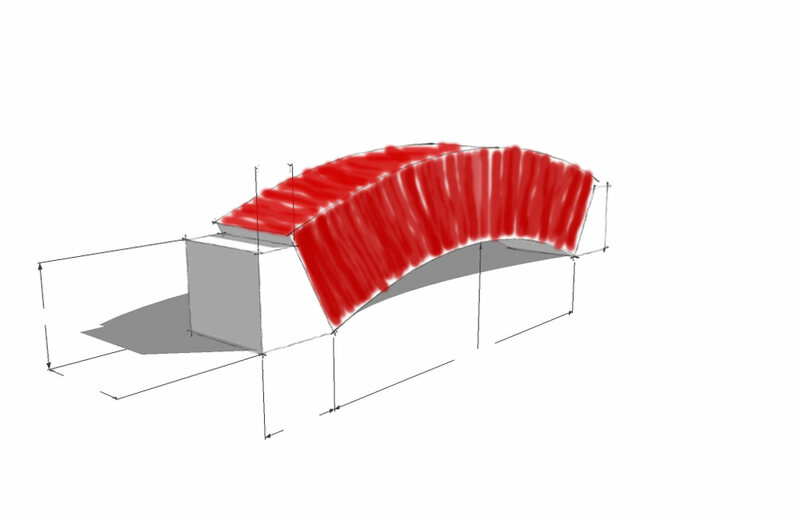 working drawings for a bridge – not the final one though..
Of course things never go smoothly. The tight timetable meant the National Park people couldn’t re-jig their busy rotas to provide the build help I was hoping for. Due to a locally controversial planning application near the original Greenside location, it was thought best not to do anything on that site this year. That meant looking for an alternative location, obtaining permissions, surveying, re-designing the bridge and re-calculating the engineering. Lots of long days in the studio and late nights with my note-book, bits of paper, cosine calculators, building and rebuilding scale models, revisiting the site as it slowly greened up through the early spring, taking photos, generating visuals and eventually it started to come back together again. 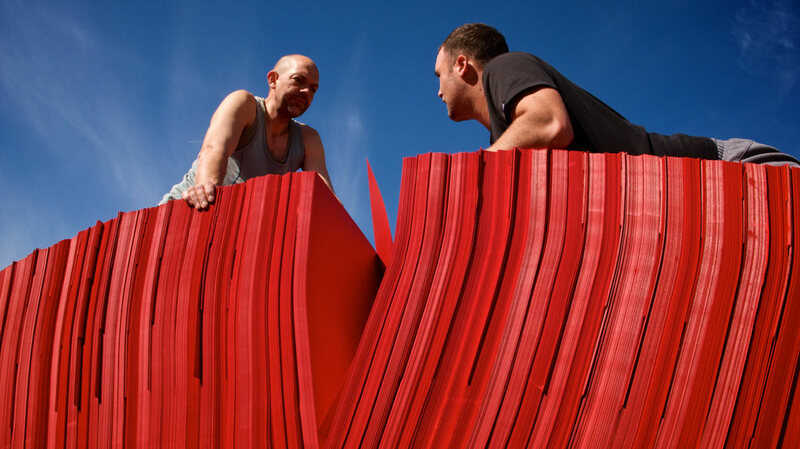 A couple of years or so ago, when we were looking at a 16 – 21 day installation period at the original location a short walk from a car park, we were looking at visitor figures in the region of 10 – 16,000. 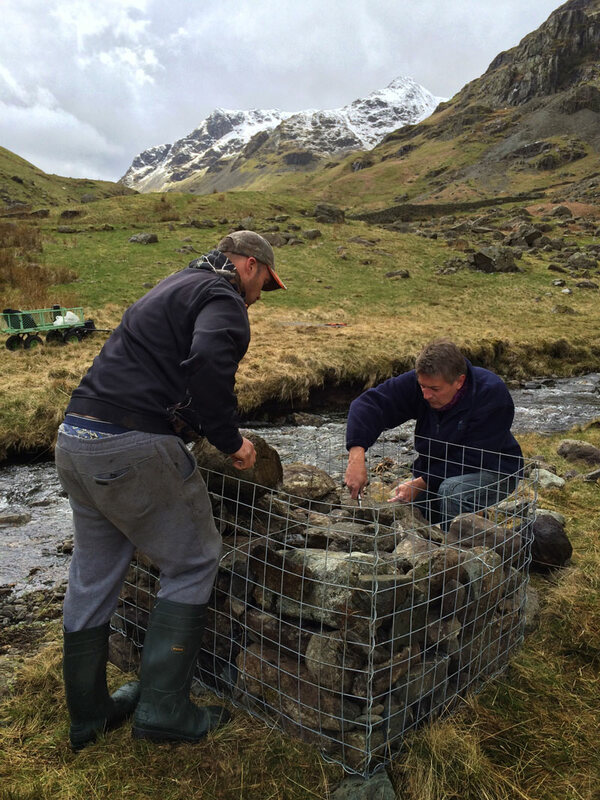 The Lake District is a great place to do this kind of work – there’s so much quality landscape environment to bounce off. It’s a well-known area and comes with its own unique sense of international branding. THere’s also plenty of other things to offer visitors so an artwork can make part of a great day out or weekend away.One of the challenges however can be the number of visitors to the area – much more than you would expect in most rural locations. While I knew the paper would easily support the weight of people on it – we even looked at the idea of taking a horse over it for a photo opportunity – I had no way of knowing what the effect of 16,000 pairs of muddy boots would do to the surface of the bridge. With that kind of visitor figure we’d need to put invigillators there to avoid bottlenecks of visitors and make sure everyone was safe on it. 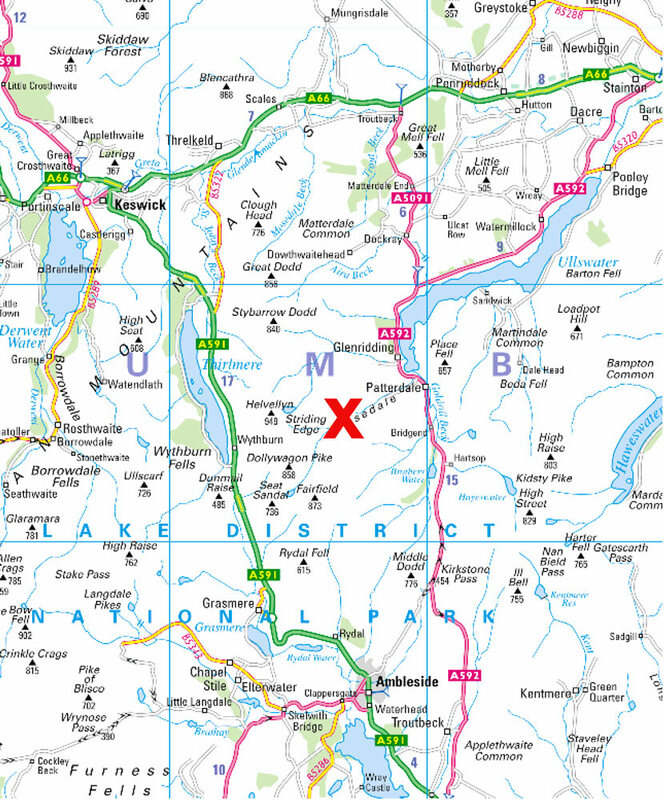 However, at this new, much more remote location – remember it’s a good 5 mile round walk from a car park – crowds were not going to be a problem. It was going to be something that passing walkers would just happen across. Maybe up to 100 people a day on busy sunny weekends. I quite liked that aspect of it – a piece so remote and temporary that it became something special for the few who saw it….